If you’re on the west coast of the U.S. or Canada and look at the web cam of Charley Young Beach a few hours after sunrise, it will be early morning on Maui. (Click on “View the Live Cam” on the left-hand side of this page to see the beach.) All is calm and the long shadows of the palm trees stretch across the beach out to the blue waters of the Pacific. Early morning strollers traverse the field of view. Couples hold hands. Dogs bounce happily along with their owners or walk sedately by their side. Joggers lope by at their chosen pace. The first swimmers take to the water. The day has begun on Charley Young Beach. As the sun climbs higher over the rim of Mount Haleakala the shadows shorten and more walkers, joggers, and beach lovers of every kind begin to arrive. 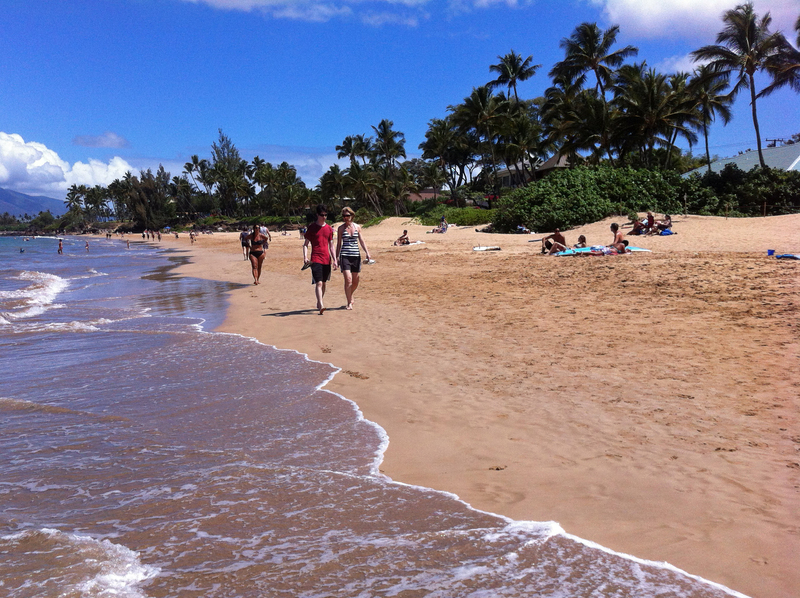 When we’re on Maui, that’s when we first go to the beach. Our ritual is simple. We wake to the dawn chorus of the many birds who make the trees of Maui Vista their home. We wait awhile or sleep some more, then get up, make coffee and sit on the lanai where we read an on-line newspaper while we have a light breakfast. Next destination: the beach. We kick off our sandals and stroll from one end to the other – a round trip of about 3/4 mile on the sand – our bare feet washed by the lapping surf. Not a bad way to start the day. From December through March thousands of humpback whales make the warm waters between Maui, Lanai, and Kaho’olawe their home. The first ones usually arrive from their arctic feeding grounds sometime in November and the last stragglers are gone by the end of April. While they’re here they mate, calve and, for months on end, do not eat. (Big exception – the calves who gain 100 pounds or more per day on their mother’s milk!) During much of the time the whales put on great displays clearly visible from the shore and awe inspiring close up. We often take binoculars to the beach to get the best views. The photos in this post were taken in early April after the most spectacular displays of breaching and fin slapping were over. Nonetheless, we saw lots of whales on a beautiful pristine day. 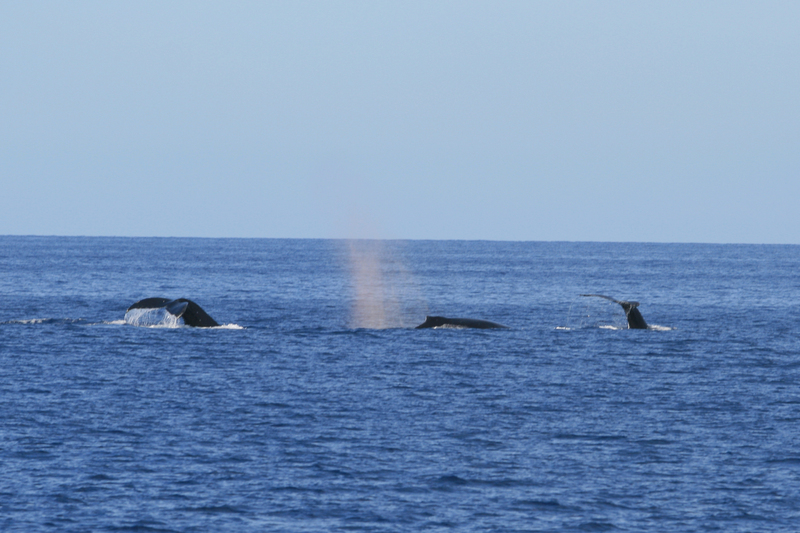 There are many whale watching cruises – we took one by the Pacific Whale Foundation. The crew was knowledgable and the trip great fun. In addition to the highlight of the mother and calf swim-by we saw lots of spouting and tail flukes like this small pod in the photo to the left. Make your friends, relatives and co-workers jealous! 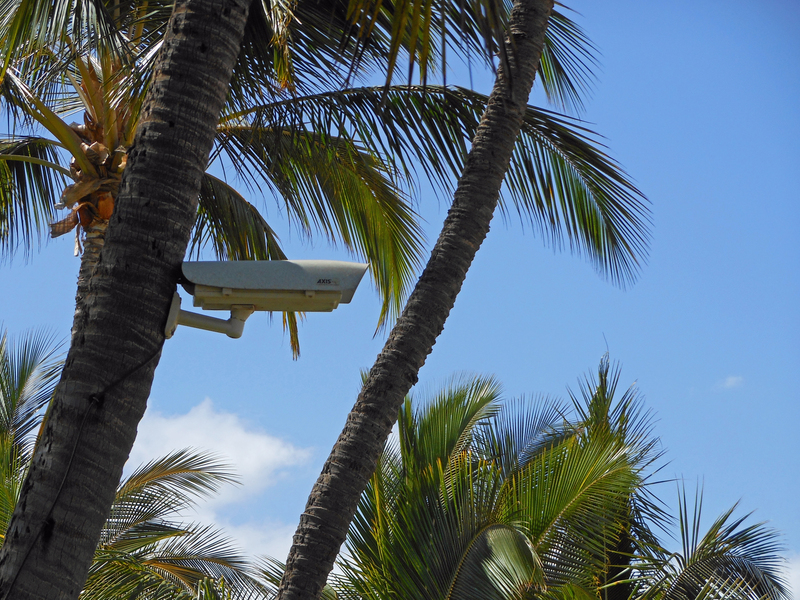 Locate the web cam on the palm tree near the north end of Charley Young Beach then stand in the camera’s field of view and call them on your cell phone. Tell them to use the nearest computer and go to the website shown below. When they’re on line, smile and wave. It gets them every time. Note: This is the web cam you can view from our blog by clicking on “View the Live Cam”. We look at it almost every day when we’re on the mainland. If you take the paved walkway inland of the outdoor shower at the entrance to Charley Young Beach instead of the stairs, you’ll walk right by it. Don’t worry, I know the walkway looks like private property, but it’s actually just another way to the beach. You’ll see the web cam above the walkway mounted to a palm tree in front of a lovely waterfront home. Sometimes when you watch the web cam the image sways from side to side as the palm tree sways in the wind. I’ve even seen a spider walk across a web woven in front of the camera lens (thereby giving a whole new meaning to the phrase “web cam.”) Once you’ve found the web cam (it’s not far) you can walk back to the stairs to Charley Young or continue on the walkway which takes you to a different beach access farther down the shore. If you don’t know where to look, it’s a little hard to spot the camera from the beach. As you get to the bottom of the stairs, turn left and walk the beach until you’re opposite the second house from the stairs. Begin looking about half-way up the palm trees and you will see the camera in the photo above. The accompanying diagram shows it’s approximate location and field of view. If you stand on the beach directly in line with the axis of the camera, you’ll be in the center of the picture. Give credit where credit’s due: the web cam is owned and maintained by the Hansen family and MauiRealEstate.net and is viewed by thousands of people every day from all over the world. Thank you Hansens and MauiRealEstate.net! Sometimes artists play at their work. From our other posts (and maybe other sources) you know that Dale Zarrella is an accomplished sculptor on Maui. (See Maui Artist Dale Zarrella at Work and Frank Lloyd Wright and the King Kamehameha Golf Club.) 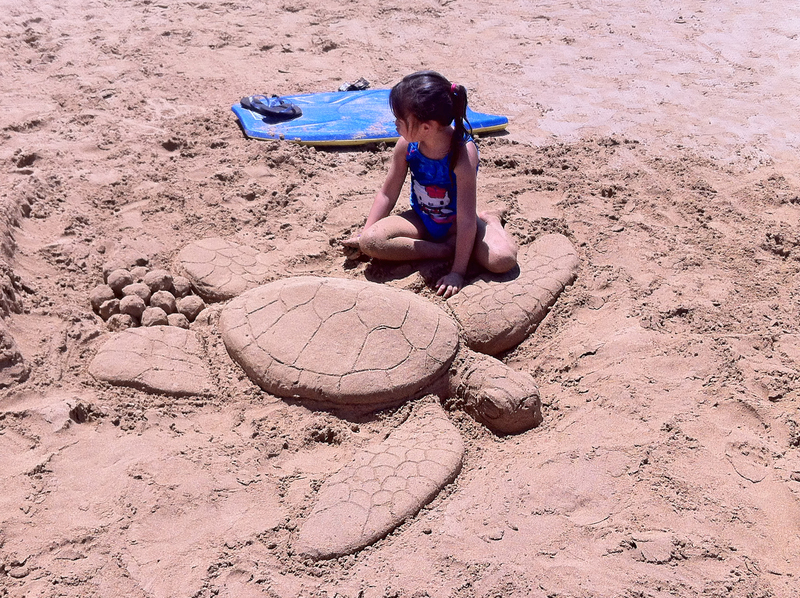 We can’t call it a timeless work of art, but in this photo Zarrella and his granddaughter have created something wonderful out of the shifting sands of Charley Young Beach. This female turtle has laid a clutch of eggs. Like her more sentient sisters she will soon disappear beneath the waves – never to know her young. You can never tell what you’ll find when you cross the road from Maui Vista and explore Charley Young Beach. We do it every day we’re here. 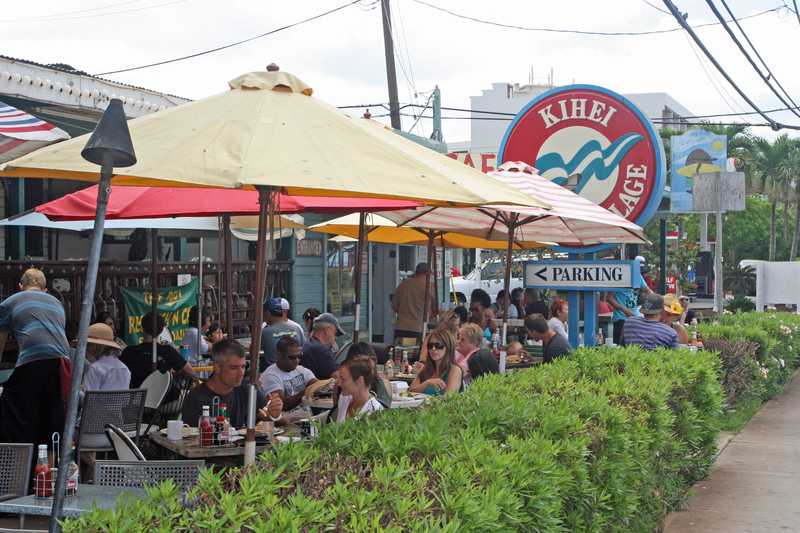 The Kihei Caffe, located across the street from Kalama Park on South Kihei Road, is a ten minute walk from Maui Vista. We rarely go out for breakfast. We usually sip our coffee and have a light meal on the lanai while listening to the birds and gazing at the ocean through the canopy of monkey pod trees. (See why we stay at home?) 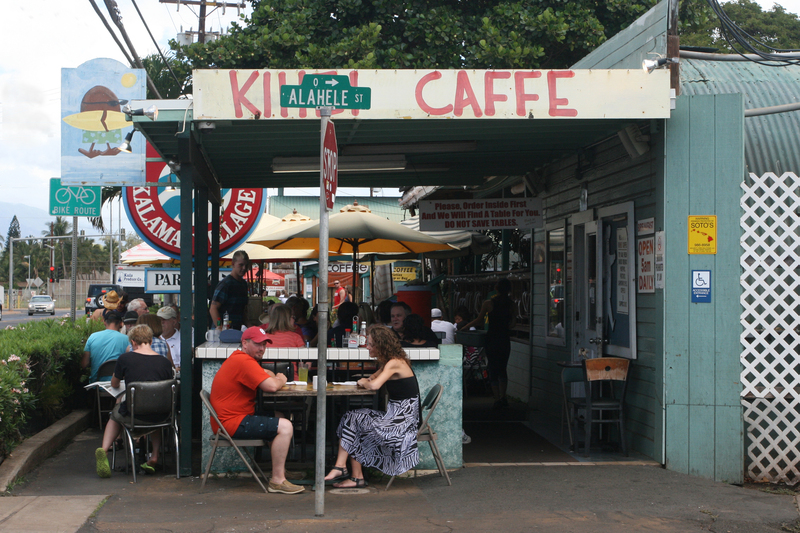 However, if we do go out, the Kihei Caffe is our destination of choice. In fact, every time we fly to Maui we ALWAYS go to the Kihei Caffe the first morning. We usually haven’t been to the grocery store (Emergency! No coffee!) and we’re still on west coast time so we’re up early. Getting up early for breakfast at the Kihei Caffe is important. They are EXTREMELY popular in the morning. They open at 5 AM and are generally crowded not long after 7:00. If you want to avoid a long line, get there early or plan to eat late. To be generous, from the outside the Kihei Caffe does not look upscale. (Ok – it looks like a hole in the wall.) If you want white table cloths in a romantic hand-holding setting, go to Wailea. You can still hold hands at the Kihei Caffe, but you’ll have to bring your own romance. You order inside where the line often snakes through a (short) stanchioned pathway like a ride at Disneyland. There is no inside seating. You order and pay then find a table outdoors. We suggest you buy pastries and/or coffee you can take to your table for something to munch/drink while you wait for the rest of your order to arrive. When it’s ready, one of the waitstaff will shout out your name as they carry your breakfast from the kitchen. The portions are large and the food is excellent. We usually split an order (ask for an extra plate) and have a big macademia nut cinnamon roll while we sip our coffee and wait for the main course. Enjoy! NOTE: Cash only…as in NO credit cards or checks. They do provide an ATM machine, but we assume that carries a fee. There’s nothing like being on the water. 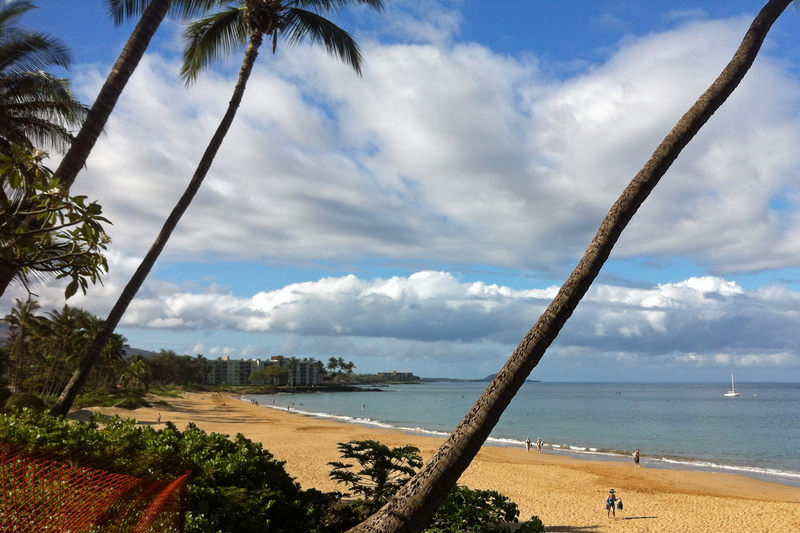 In Maui you can use a paddle board, surfboard, boogie board or – to travel in style – you can rent a kayak. 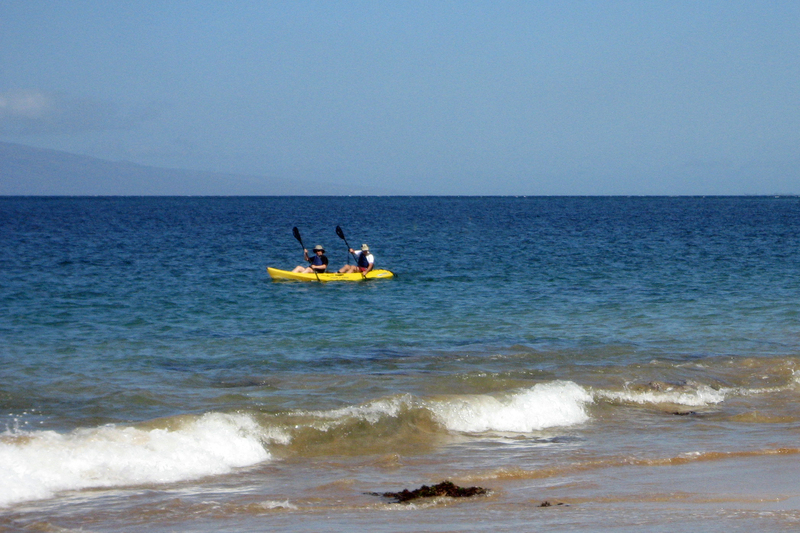 The nearest kayak rentals are at Maui Wave Riders, a few blocks north of Maui Vista on South Kihei Road. In May 2012, two hour rentals for a two-person kayak were $35; all day rentals $50. Since the best (and safest) kayaking is in the morning before the winds pick up, you may be able to get by with the two hour rental if you’re efficient with your time and don’t travel far. On the other hand, most days have at least four hours of reasonably calm seas, so a $50 rental may be worth the extra bucks. At Maui Wave Riders the price includes pads and tie-downs so you can take your kayak just about anywhere. Start early in the day to have the most fun. Almost all the kayaks you see on Maui are one-piece hollow molded plastic boats. You might get your bottom wet from splashed water but, without taking an axe to the hull, they are virtually unsinkable. That said, be aware that kayaks will roll when sideways to the waves, so be cautious. If you don’t know what you’re doing, think about signing up for a group kayaking tour before going out on your own. They provide guides, give instruction, and, if there is a problem, someone is there to help. It’s no joke to be out on the ocean when the seas get rough and the winds are against you. 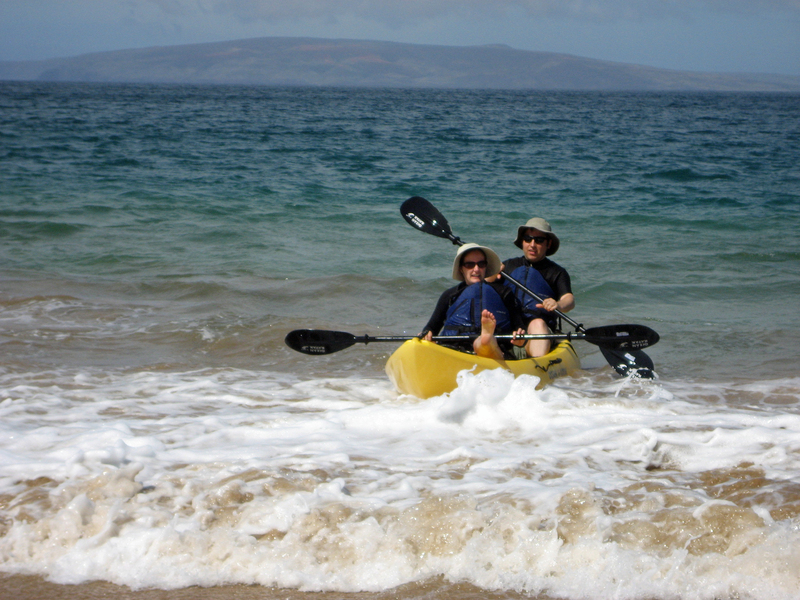 Our favorite place to kayak is Makena Landing. If you’re at the Landing in the morning you’ll see lots of kayak tours starting from there. Many of these tours are combined kayak/snorkel groups. You paddle out to a good snorkel spot then roll out of your boat into the water. The tour guide secures the kayaks so they don’t float away while you’re snorkeling. I’ve never tried it but I think it’s probably a lot easier to roll out of a kayak in deep water than to get back in. 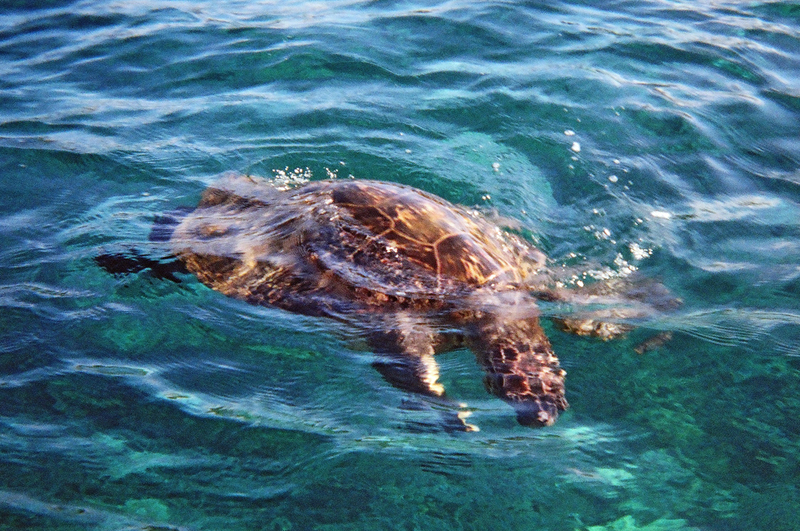 The reason why so many kayak tours start at Makena Landing is why we like it too – green sea turtles! From the beach it’s a short paddle to the area the big snorkel boats call “turtle town.” When the snorkel boats are there it’s easy to find. If they’re not, paddle out from the cove and keep to the right. There are two long fingers of lava jutting out under the water from the end of the point. Float over these and look for caves in the lava tubes. 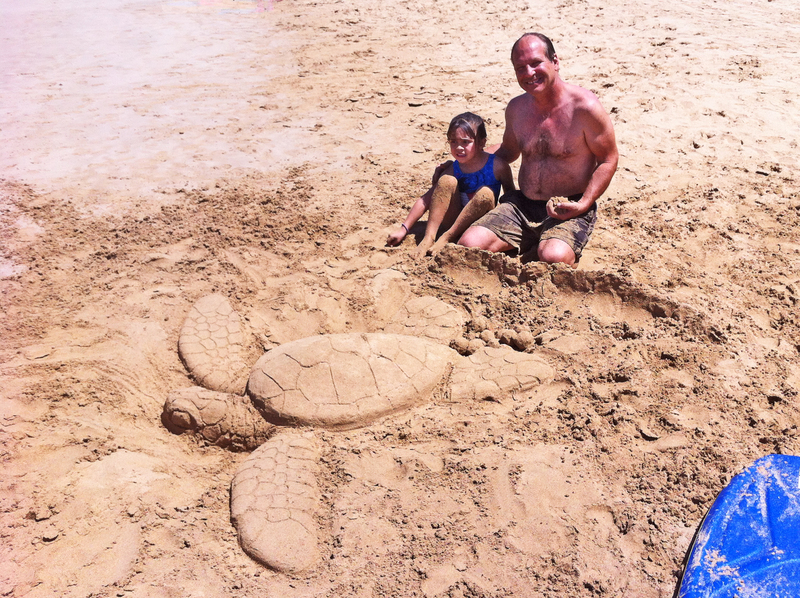 That’s were the turtles are – including big adults that can weigh hundreds of pounds! Listen for their hiss when they surface and exhale. We had to pull our paddles out of the water to avoid bumping the beauty in the picture above. They get that close. There are turtles to the south of Makena Landing as well. Avoid the obvious rocks, and those that are barely submerged, but keep reasonably close to shore while you float over coral formations and look for turtles and fish. As you head south you’ll pass an old stone church and then come to a large sandy beach and resort. Kayaking further south toward the cinder cone is fun too. As you may have noticed, green sea turtles aren’t actually green – at least on the outside. From what I’ve read, it’s the meat inside that’s green. Perhaps the color comes from their diet of sea grass and algae. Despite what sounds like an unappetizing color, green sea turtle was a delicacy for whalers and others before it became a protected specie. Even when the waves are small, landing a kayak can be difficult. The trick is to keep the boat perpendicular to the surf. Move slowly toward the shore while looking over your shoulder to time the waves. Paddle quickly just before the break and glide in. It’s best if the person in back jumps out and holds the handle/rope at the stern to keep the kayak from turning while the person in front gets out. If you do get sideways, you’re going to get wet. That’s why you wear a bathing suit and leave those valuables behind. If you want to take pictures, keep your camera in a secure water-proof container when not in use. If you want to get close to turtles but don’t want to rent a kayak, see our post titled South Maui Snorkeling – Makena Landing. There are many boats that will take you to Molokini for snorkeling. Some also go to “turtle town” where it’s likely you’ll see a turtle or two. 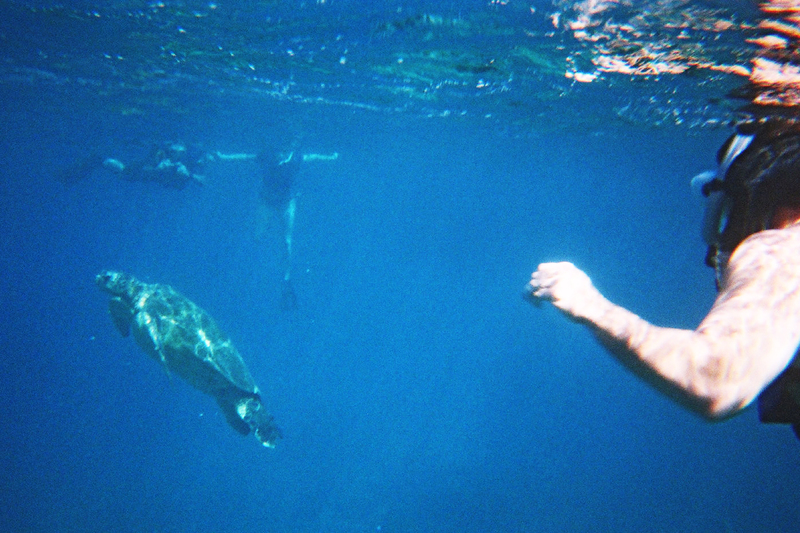 (See our posting on “South Maui Snorkling – Makena Landing” for a no-cost option to swim with turtles.) Some trips to Molokini are longer and some shorter. Some provide food and drinks. Some do snuba at extra cost. (Snuba is sort of like scuba but without the freedeom of movement and without the air tank on your back.) While we provide free snorkel gear at our condo, all the boats provide their own. Shop around to find the trip which is best for you. The seas are generally calmer before the wind picks up so go in the morning unless you have no other choice. On a clear day you can see to a depth of 80 feet or more so the ideal time to go is a calm morning with no, or few, clouds. Of course, you usually have to make reservations in advance, so the conditions may not always be perfect. Snorkel boats leave from Maalaea Bay – about a 20 minute drive north of Maui Vista. (They also leave from Lahaina, but don’t bother.) Take the road toward Lahaina and watch for the signs to Maalaea Bay. Allow time for parking and walking to your boat. The Island of Molokini isn’t large but it looks tiny from the shore because it’s far away. Dependng on the speed of your boat the trip over will take about 45 minutes plus or minus. 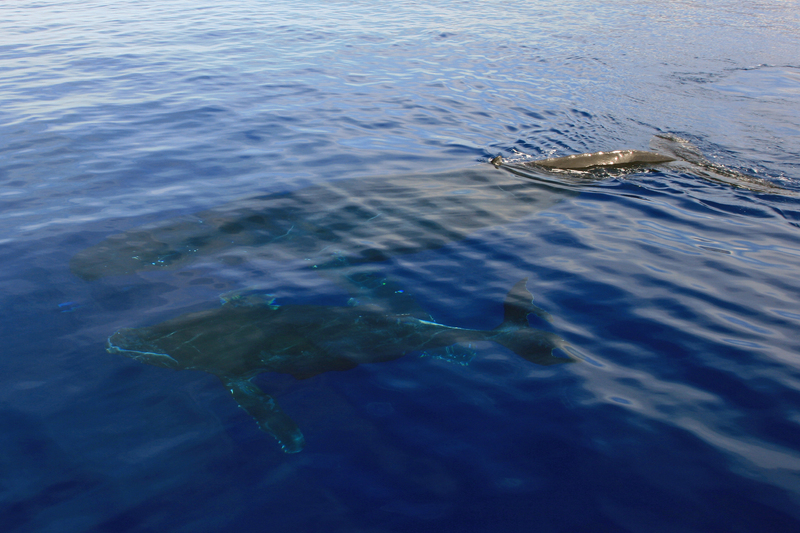 From December through March you’ll probably see whales while you’re cruising. If you’re lucky you can see dolphins any time of year. Some dolphins may even ride the bow wave and spinner dolphins can put on quite a show. As the boat arrives as Molokini one of the crew will dive overboard with a rope. He or she will disappear below the surface to attach the rope to an underwater bouy. An anchor at the stern keeps the boat in place while you enjoy the sights. Each snorkel boat has it’s own designated bouy. I think they all say they have the best location. 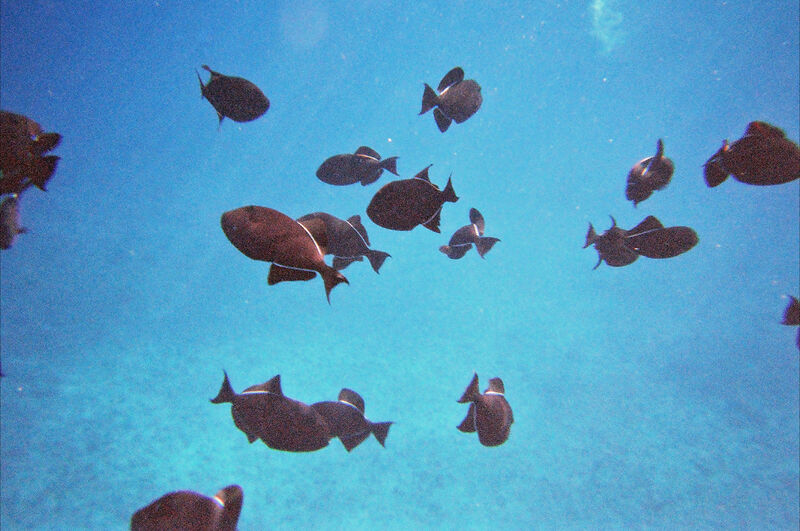 You will see lots of fish and beautiful coral at Molokini – maybe an eel or two. In whale season you can sometimes hear the whales singing when you’re under water. 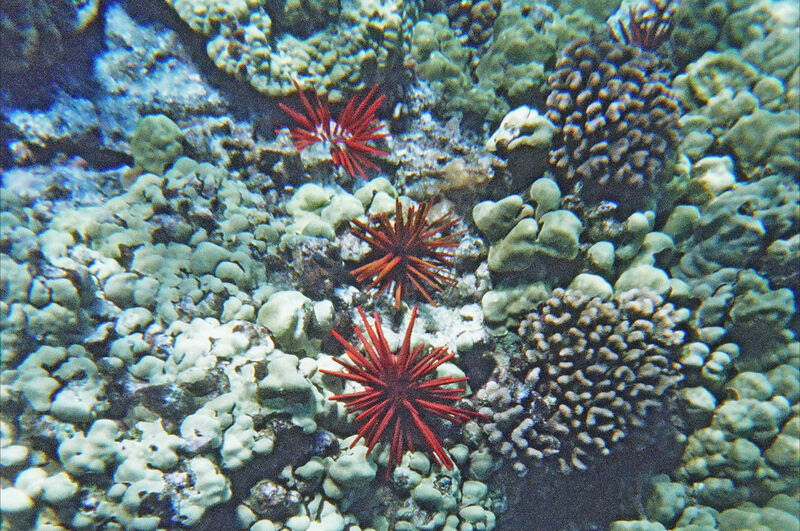 It’s probably the premier spot to snorkel in Maui. After as much time as almost anyone could want in the water, your boat will leave Molokini. 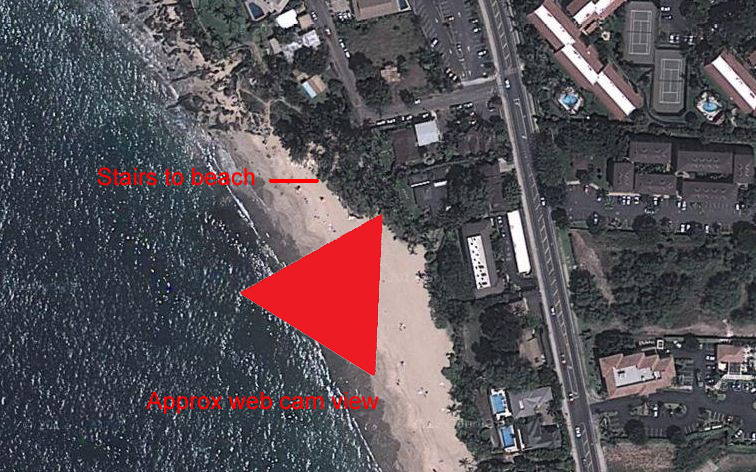 If your boat goes to “turtle town” it will head east to a point just north of Makena Landing on Maui. At “turtle town” there are two parallel lava tubes jutting out from the shore which support coral and form underwater caves. The turtles like to rest in these caves where they feel safe from the few predators that can do damage to a full grown turtle. While they can hold their breath for long periods of time, eventually these turtles have to breath. In this picture that Kathy took a large male is coming up for air. If you’re on the surface you can hear them hiss as they exhale. They’ll generally take a half dozen breaths or more before decending for another rest. It isn’t necessary to go to Molokini to have a great time snorkeling on Maui but, if you go, you won’t regret it.